Most of us are using Google Checkout. Now, the news is that Google Checkout is merging with Google Wallet. Therefore, Google will no longer have both the payment services. Google says, "We're starting to take all the great functionality and ease-of-use you've come to know with Google Checkout and merge it with Google Wallet to create a single wallet, whether you're buying online or in-store. We're also starting to integrate Google Wallet as the payment method on Android Market, YouTube, Google+ Games and many other Google sites." 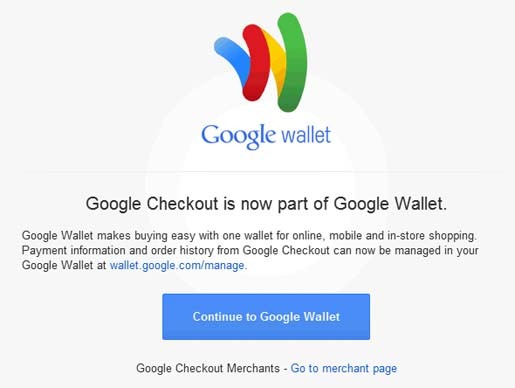 If you’ve been using Google Checkout, you will be redirected to wallet.google.com when you log in. Moreover, the transactions and payment methods can be easily managed there. Now, you can say Google Checkout as Google Wallet Online Service. It is free service that lets us carry our wallet on the web. For the moment, Google Wallet will work on in the US and the Android app is only available if you buy a Sprint Nexus S 4G phone.